Åbo Akademi University Laboratory of Aquatic Pathobiology / Parasitological Institute in Turku 50 years. 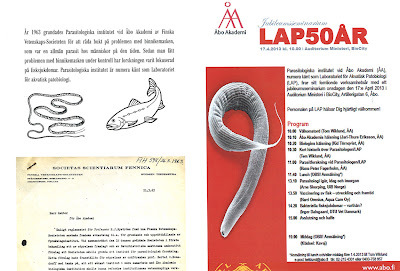 The Parasitological Institute was founded by the Finnish Society of Sciences and Letters (Societas Scientiarum Fennica) in 1963 as an independent research institute at Åbo Akademi University. In the 1980's the Institute was integrated with the Department of Biology, Åbo Akademi University. The Institute changed name in the 90's to the Laboratory of Aquatic Pathobiology in order to better describe the current activities. In the beginning, the main goal was to use research-generated knowledge to help eradicate the broad tapeworm (Diphyllobotrium latum) from Finland. While as late as during the 50’s, the infection was rather common, the prevalence regionally reaching even 20 %, the disease is now rare, but not entirely eradicated. Studies showed that pike, burbot and perch, but not vendace, whitefish or salmon transferred the infection to humans. Figure 1. 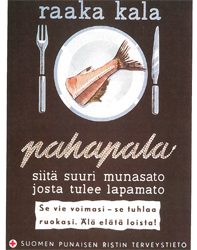 Finnish Red Cross Diphyllobothrium latum combat poster from the 1950’s. Its text gives a clear warning with a rather unprecise description of the tapeworm life cycle. Especially in the 70’s and 80’s, the Laboratory research was mainly focused on zoonotic parasitic infections, but also on parasite-related fish diseases and parasite biology. The activity has in recent years focused mainly on bacterial diseases in wild and farmed fish, and the research has produced internationally important results. Also, viral diseases in fish have been studied. Ongoing parasitological studies have dealt with the biology and systematics of ascaridoid nematodes, and recently also the myxozoan parasite Henneguya zschokkei in farmed and wild whitefish. 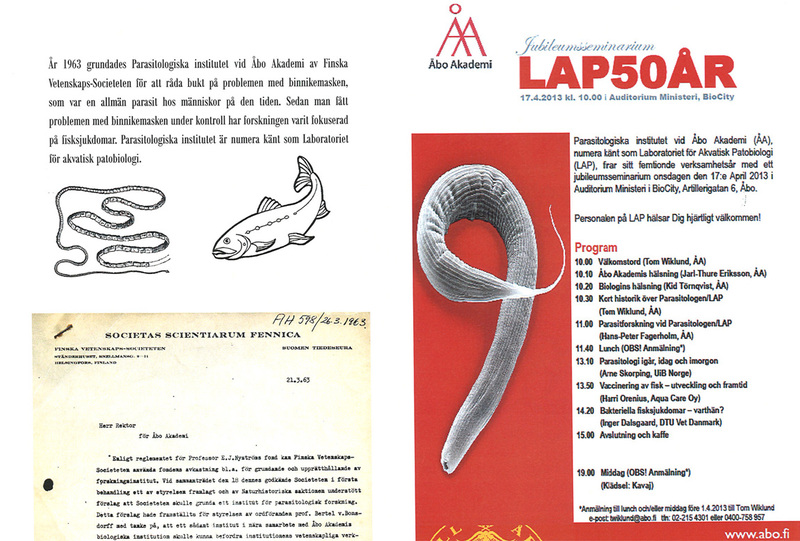 On April 17th, 2013, the Laboratory will celebrate its first 50 years with a Seminar where, among others, Dr. Tom Wiklund will shortly present the 50-year history, Dr. Hans-Peter Fagerholm will speak about parasitological research at the Laboratory of Aquatic Pathobiology / Parasitological Institute, and Prof. Arne Skorping (University of Bergen) about parasitology yesterday, today and tomorrow. The Seminar language is mainly Swedish/Scandinavian. The Seminar will be finished with a banquet dinner.